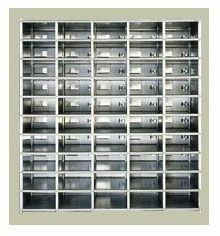 The 1550/901 Series Rear Loading Horizontal Mailboxes are constructed of all aluminum extrusions and materials. 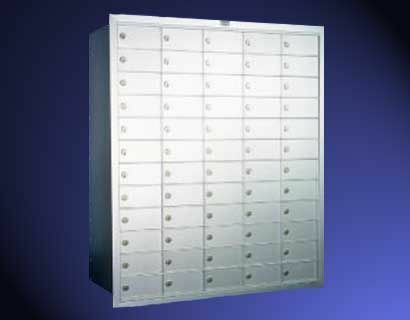 Standard 901 series horizontal mailboxes are available in "A" size compartment, 3"h x 6"w and configured in modules 3, 4 or 5 boxes wide and 12 boxes high. Each 1/8" extruded aluminum door swings on a continous hinge and is equipped with a 5-pin cylinder cam lock with 3 keys (1500 changes). Doors include permanent 3/4" high engraved identification. All modules have standard 3/4" integral trim. The 3" h compartments are ideal for applications where a large number of boxes is required. Consult our sales staff for assistance with customizing units for your specific needs. Rear�loading boxes require a rear cover. All Horizontal Mail Boxes are recess-mounted.